We are trusted as a reliableÂ Stainless Steel BoltsÂ Manufacturer & Supplier. 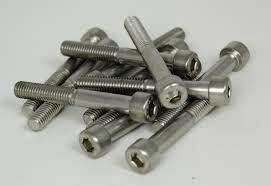 The Stainless Steel Bolts such as Hex Head Bolts, Hexagon Head Screw, Mushroom Head Square Neck Bolts, T- Head Bolts, Wing Screw, Eye Bolt, Lifting Eye Bolt, and Countersunk Raised Head Bolts. These Stainless Steel Bolts are designed as per the set standards by utilizing well-tested methods & raw materials. With the support of our well-equipped production unit, we are able to produce bolts in bulk at a time. When it comes to delivery, we make all arrangements for quick shipment of Stainless Steel Bolts.